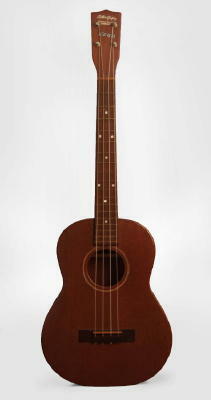 Vega Arthur Godfrey Model Baritone Ukulele, c. 1951, made in Boston, Mass., natural finish, mahogany body and neck; rosewood fingerboard, original brown alligator grain soft shell case. Overall length is 29 in. (73.7 cm. ), 10 in. (25.4 cm.) wide at lower bout, and 3 in. (7.6 cm.) in depth at side, taken at the end block. Scale length is 19 in. (483 mm.). Width of nut is 1 3/8 in. (35 mm.). Very clean, all original with a fine original case...an extremely nice example! Excellent + Condition.